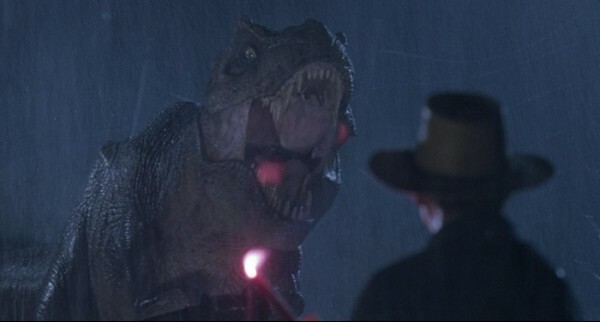 As Jurassic World continues to demolish records on its way to reigning as the top summer box office champ for 2015, a Jurassic-sized reunion that had been about 23 years in the making took place on the evening of Friday, June 26th. 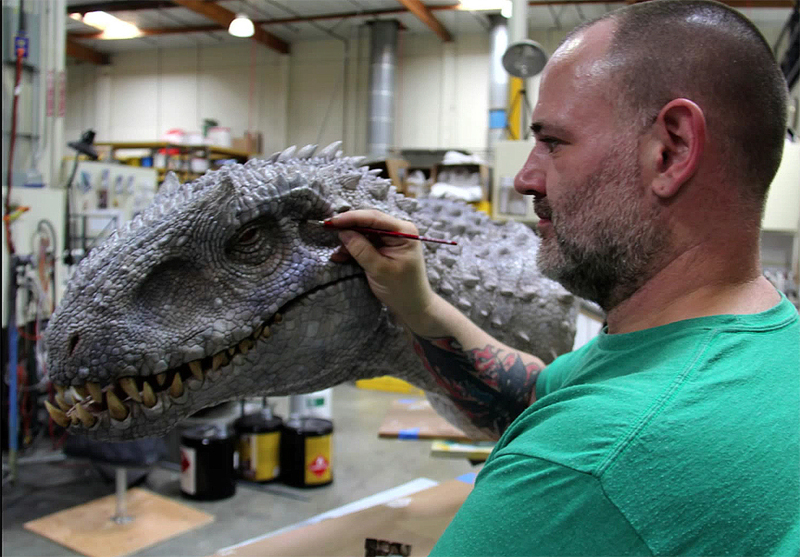 Sponsored by the Stan Winston School of Character Arts, the ‘Jurassic Party,’ brought together many of the artists, craftspeople, and technical wizards who were directly involved in the creation of the live action dinosaurs from each of the four Jurassic Park movies. 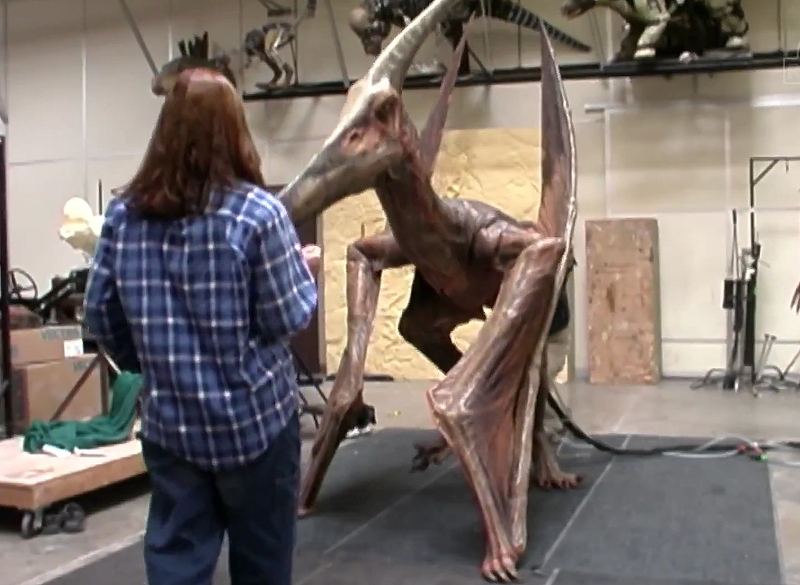 The online subscriber-only event was conceived by artist Beth Hathaway and quickly brought to life by Matthew Winston, son of Special Effects wizard Stan Winston. 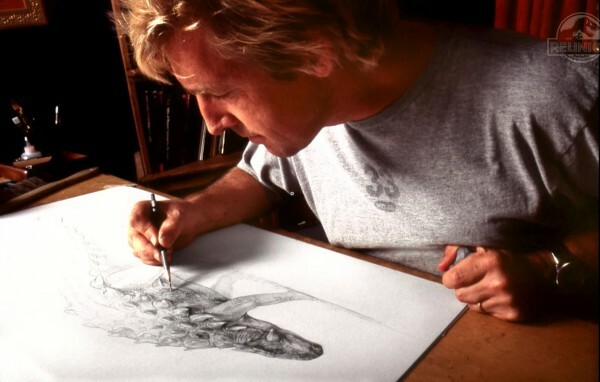 Matt currently serves as Co-Founder of the Stan Winston School of Character Arts, an institution that maintains Stan Winston’s legacy by inpiring creativity and know-how in a new generation of character creators through online instruction by Hollywood’s top artists. 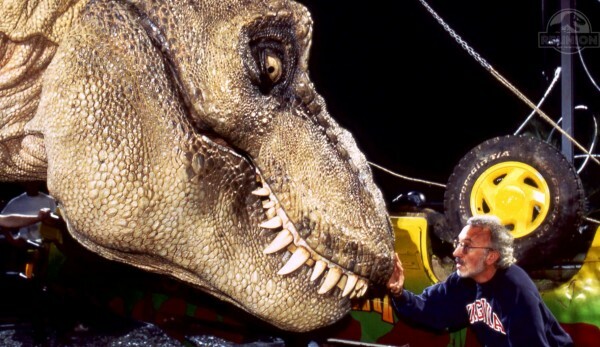 Many of those top artists responsible for bringing dinosaurs to life, starting with Steven Spielberg’s Jurassic Park in 1993 and going through each of the sequels to this summer’s, Jurassic World, were in attendance for the reunion. 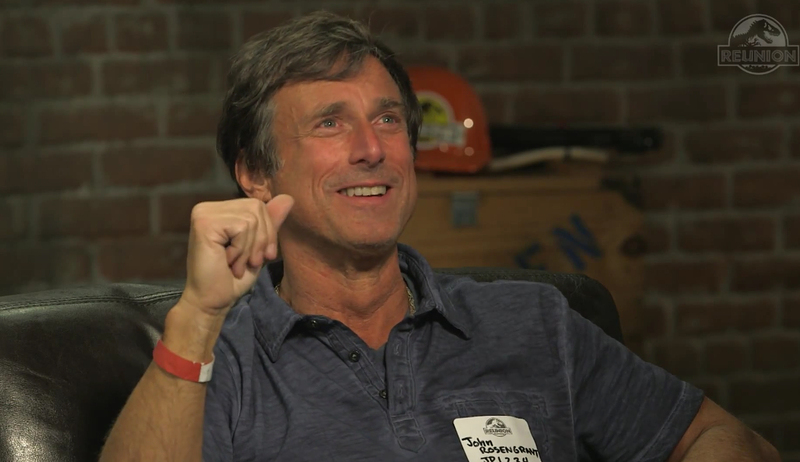 The broadcast, originally planned as a 4-hour event that actually went on to be 6 hours in length, was an enormously fun and informational look at the creation of the dinosaur characters as recounted by the men and women who knew them best. 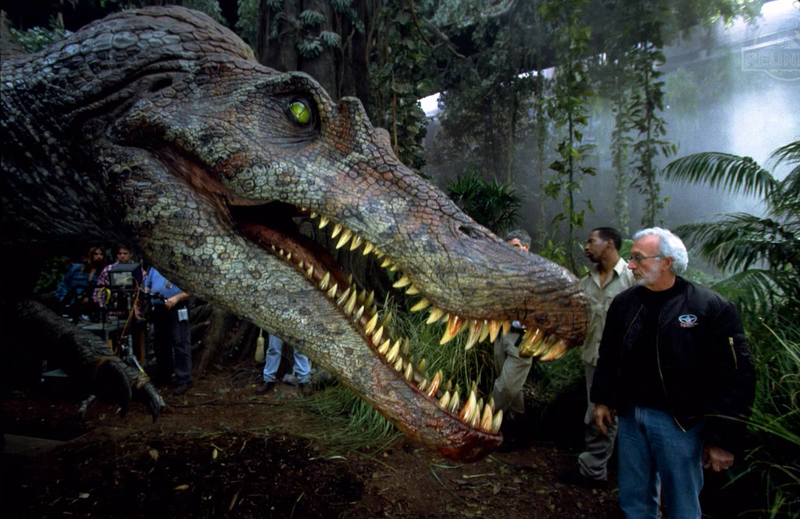 For fans of the Jurassic Park franchise who thought they had read, seen and heard every behind-the-scenes tibdit about the making of the movies, the reunion brought forth a goldmine of facts and anecdotes. It also provided a means for fans to ask the crew for answers to some of the most pressing questions about the live action dinosaurs. The evening started off with some tongue-in-cheek humor by Matt Winston saying that no one had showed up for the reunion. 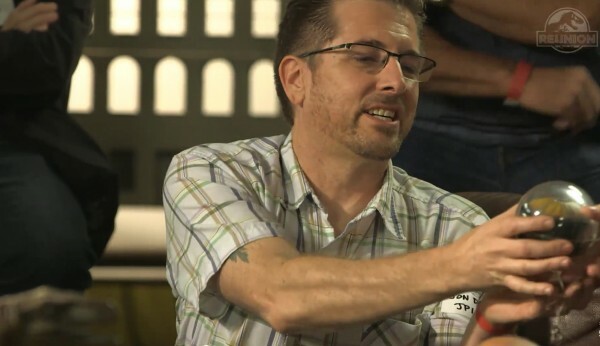 He quickly reversed that statement and made it clear that the turnout for the reunion was a huge success and that almost every attendee who was invited would take part in the online event that evening. 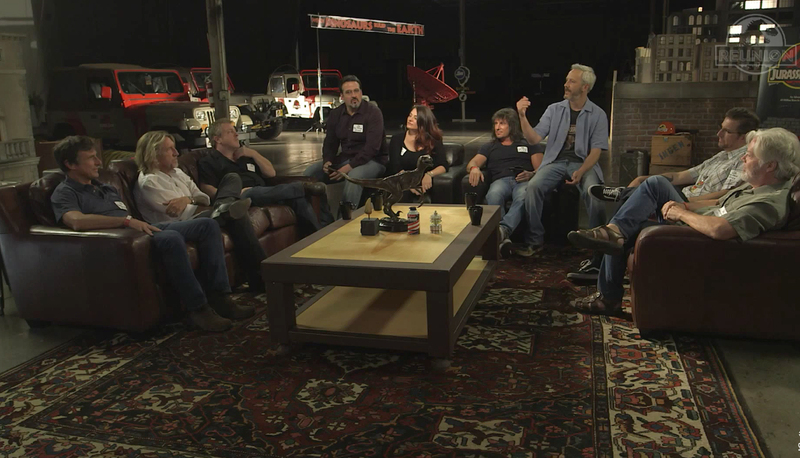 With a modest set decorated only with a few Jurassic Park props and Jeeps in the background, the atmosphere lent itself to an appropriate focus on the men and women who created the dinosaurs, aided only by pictures and videos (some never-before-seen) which were interspersed throughout the discussions. 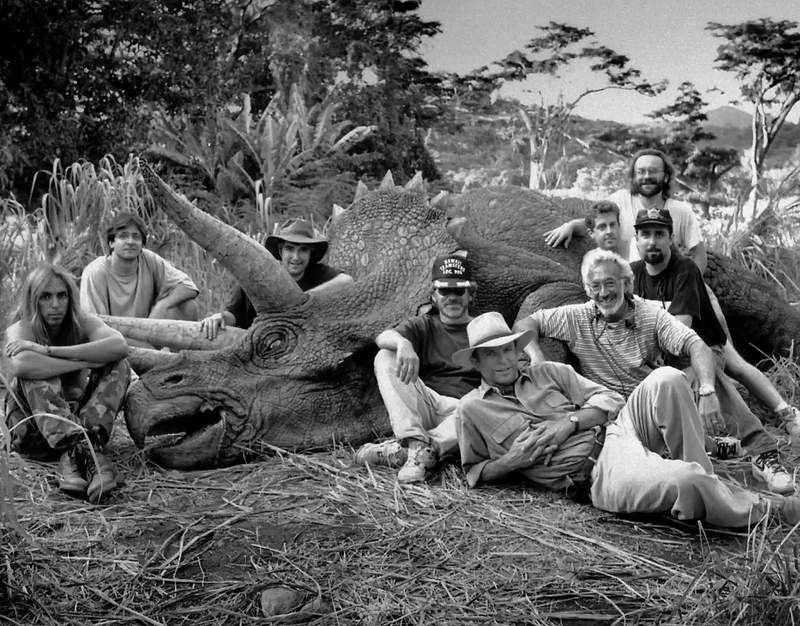 After the first two-hour mark of the broadcast, the Jurassic Park crew members were still talking about the first movie and they probably could have spent the entire evening discussing the original production and no one would have minded. 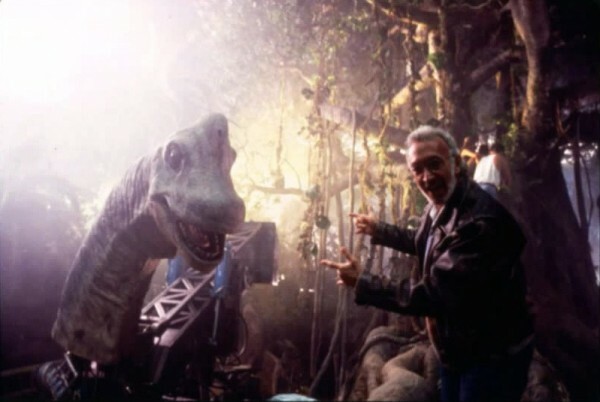 Stan Winston’s right-hand crew man, John Rosengrant, contributed a lot to the conversations and stated that Jurassic Park was truly a “movie of invention” that called upon the talents and ingenuity of every craftsperson involved. 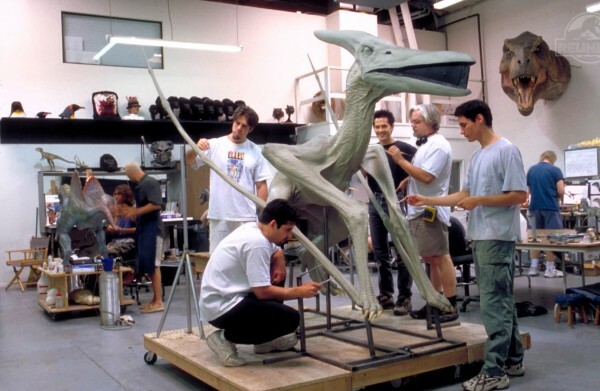 The overall picture was of a creative team learning by trial and error on the first film who were then able to rely heavily on their experience and refinement of the craft of live action dinosaur creation with each Jurassic Park movie sequel that followed. It was enlightening to hear the crew talk about the advances in design and craft technology that took them from originally creating a full-size, 36 ft. long Tyrannosaurus Rex sculpture out of Roma clay (that could hardly be moved) to the creation of a full-size Spinosaurus foam sculpture that was about 1/4 the weight of the original Rex. 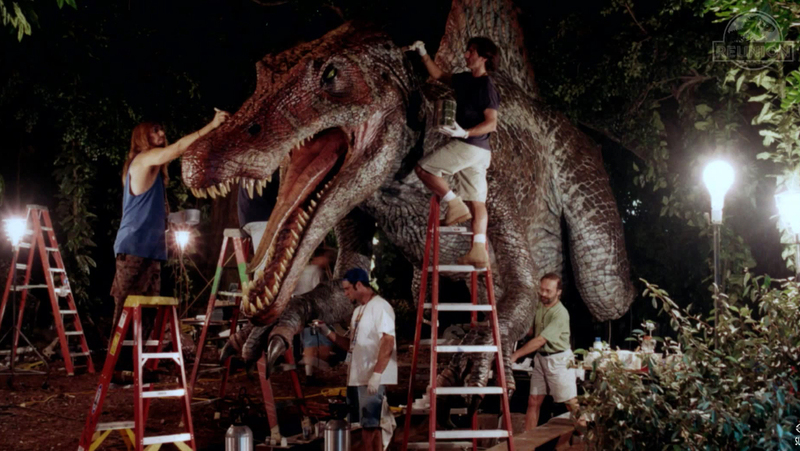 John Rosengrant commented that in the 3-4 year time span between the original Jurassic Park and the making of The Lost World, there were already quantum leaps in sculpting and rendering technology that made the creation of the dinosaurs a much simpler process. 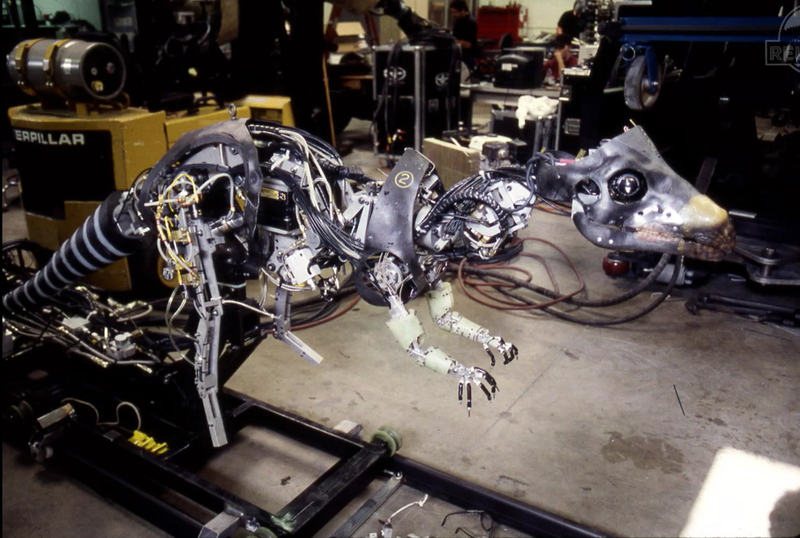 When new tools emerged, the crew followed Stan Winston’s lead in adapting the new technology to their craft. 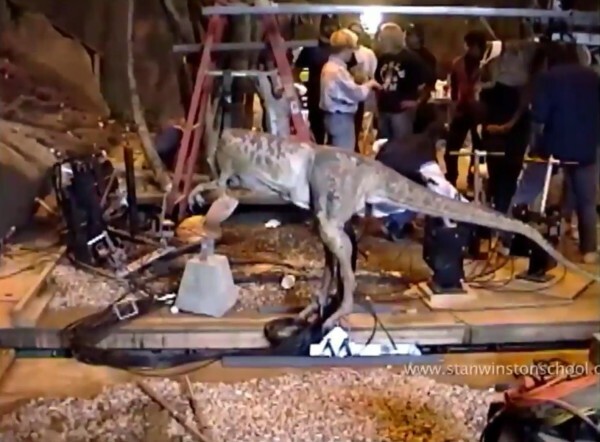 While an evening focused on animatronic dinosaurs could have led to a condemning of the current overuse of CGI in place of practical live action effects in movies, Matthew Winston made the following statement early on; “CG and live action working well together is the key to making movie magic. We do not slam CGI here, we just prefer making big ole puppets.” Throughout the discussions on each movie, much was focused on the synergy between the Stan Winston Studio and ILM and how instrumental the Winston crew had been in the creation of the CG dinosaurs, even at times when they were not required to build anything in the physical realm. Hearing the artists talk about the challenges each film presented in terms of increasing time constraints to build the dinosaurs; it’s quite amazing what they managed to accomplish. As the discussion centered around Jurassic World, it was apparent that a current emphasis on CGI and fast pace of modern day filming schedules left little work for the live action dinosaur crew in comparison to the previous three movies. However, it was interesting to hear that Legacy Effects (the successor company to Stan Winston Studios) was brought in along with Phil Tippet and ILM due to their history and experience with the dinosaurs of the Jurassic Park franchise. 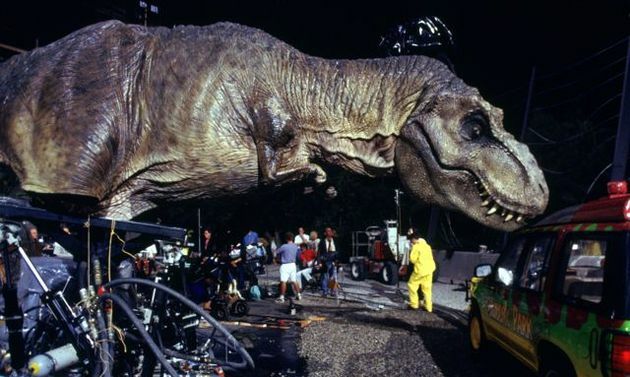 In light of the massive box office take of Jurassic World, fans of the movies can only hope that Universal Pictures will allow a bigger budget for the next installment so that Legacy Effects can once again create more live action behemoths. 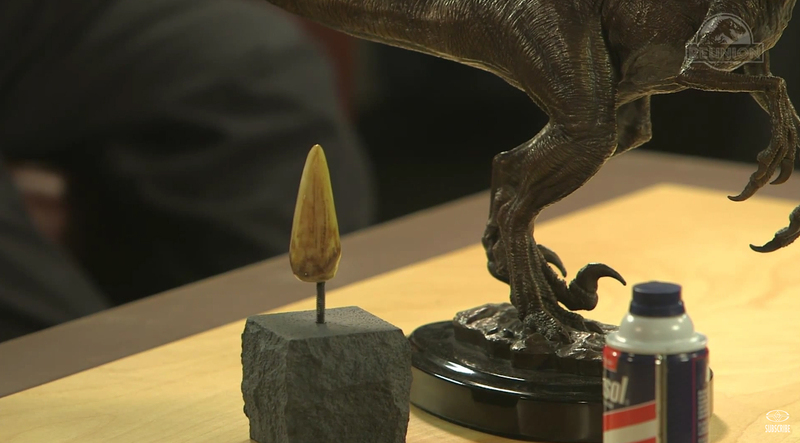 If you consider yourself a die-hard fan of the Jurassic Park franchise, definitely take the time to watch all 6 hours of the ‘Jurassic Party’ reunion online when it becomes available. 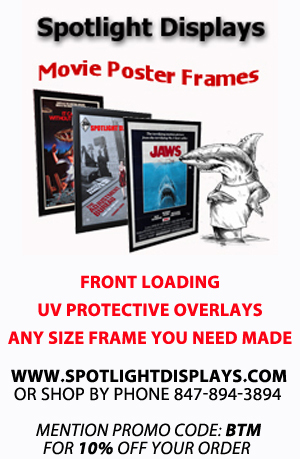 It serves as a great addition to behind-the-scenes information that has already been released in books, magazines and DVD’s. 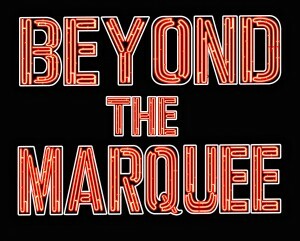 Following the ‘Jurassic Party’ event this weekend, Beyond the Marquee spoke to Matt Winston as he was still recuperating from the successful evening. 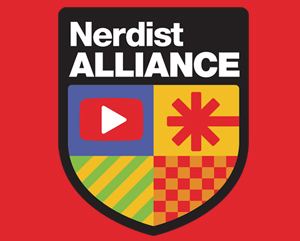 For those who are interested in watching the full 6-hour broadcast, Matt mentioned that within the next few weeks, the full video will be available for purchase via a digital download at www.stanwinstonschool.com. 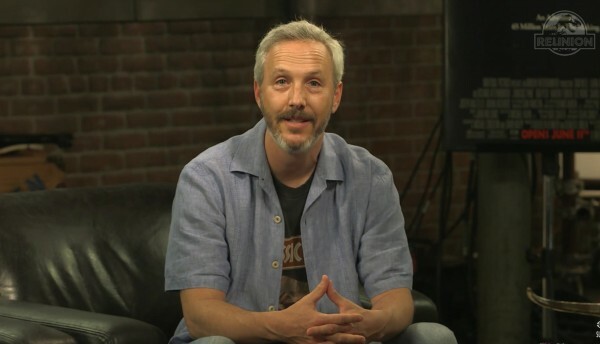 He also mentioned that several clips of the event will start showing up soon on the Stan Winston School’s official YouTube channel. 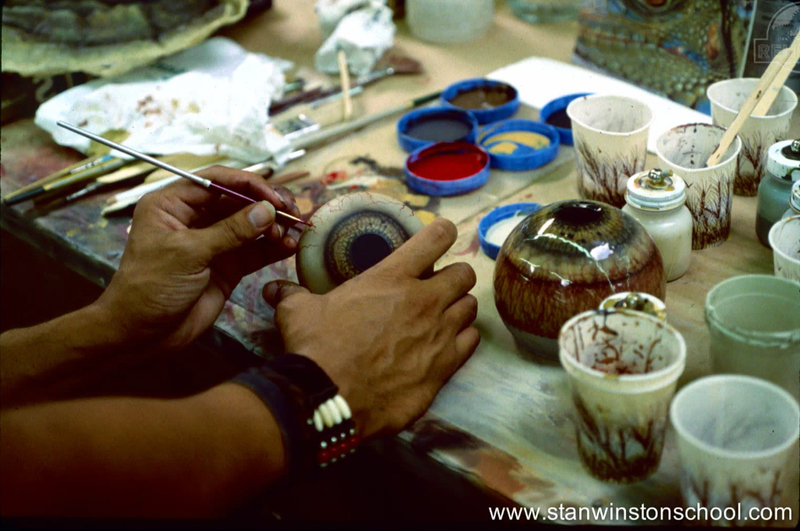 You can keep track of Stan Winston School of Character Arts happenings by subscribing to their Facebook page. Make sure to subscribe to the Beyond the Marquee YouTube channel and Facebook page for more exciting Jurassic Park and Stan Winston School of Character Arts behind-the-scenes content. 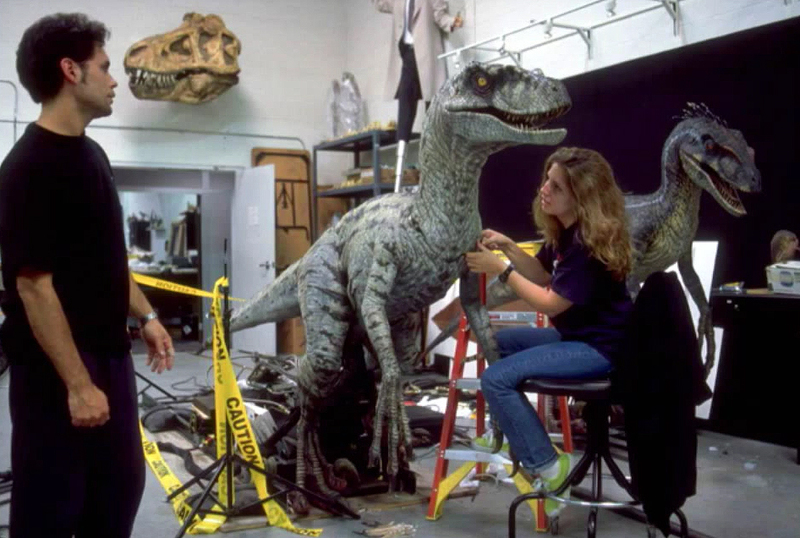 Disney Imagineer and Legend, Bob Gurr, was consulted early on in the design of the Tyrannosaurus Rex and contributed ideas and a model for the initial structural design. 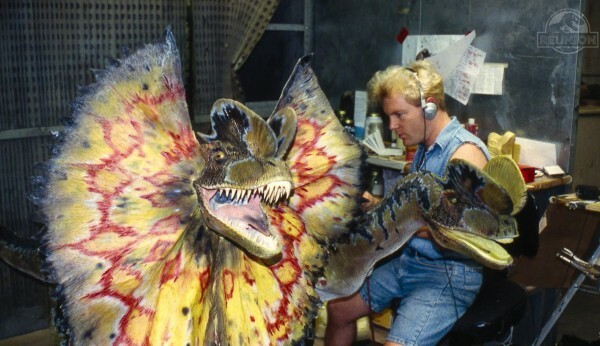 Watching the first film, it’s hard to see that the Raptors were actually painted with orange and yellow color patterns. The lighting on set rendered the raptor colors a muted gray, hiding much of the detailed paint design. Sam Neill improvised his performance during rehearsal with the breathing Triceratops by laying his full weight on its side. This came as a surprise to the puppeteer operating the breathing mechanism underneath as he was not prepared for the additional 150 lbs. in weight. Most of the dinosaur snot and saliva was made from specially-formulated batches of chemicals with soap sometimes added in to create a bubble effect. 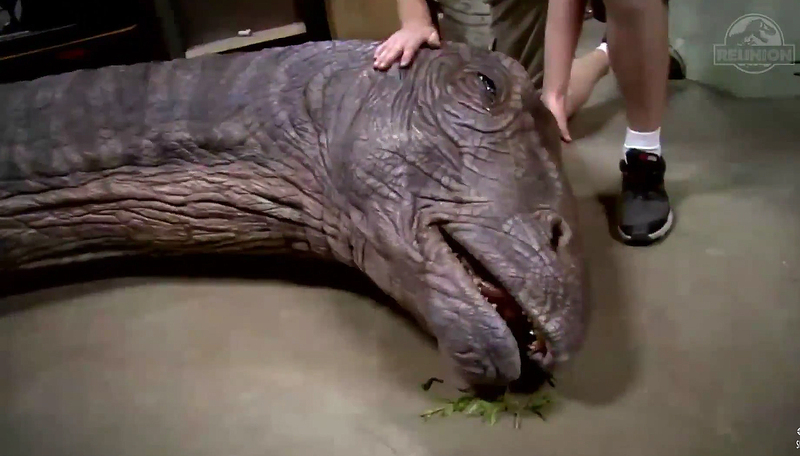 Chopped spinach was included in the Brachiosaur snot to give it an earthy, plant-eater realism. 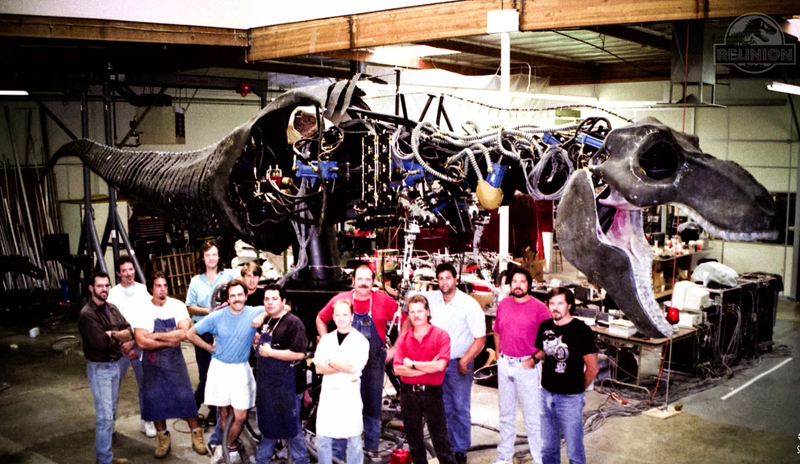 Sculptor Mark Jurinko was afraid of heights and was directed to work at the top of a high scaffolding over the T-Rex. He could not bring himself to climbing the ladder even after Stan Winston told him it was his job and he had to do it. 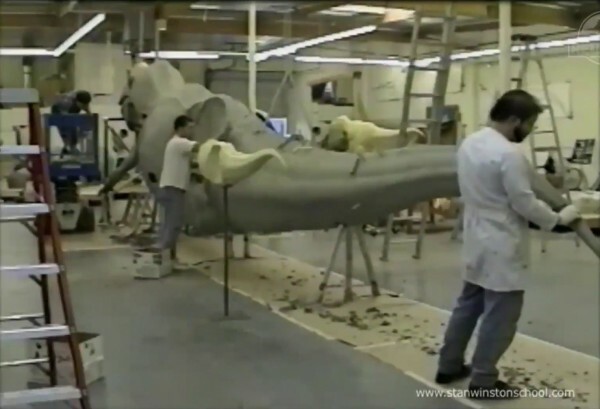 Awhile later, seeing that Mark still had not climbed up, Stan Winston took him in his car and drove to Magic Mountain, taking Mark on the “Colossus” roller coaster to conquer his fear of heights. The ‘therapy’ worked. Throughout much of the production, many of the dinosaurs fell prey to hydraulic fluid leaks. 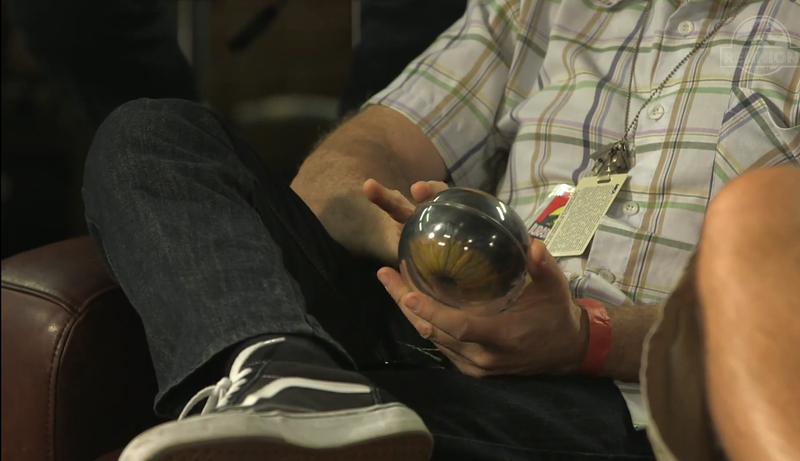 More demands had been placed on the dino mechanisms with higher pressures to create more fluid movement. 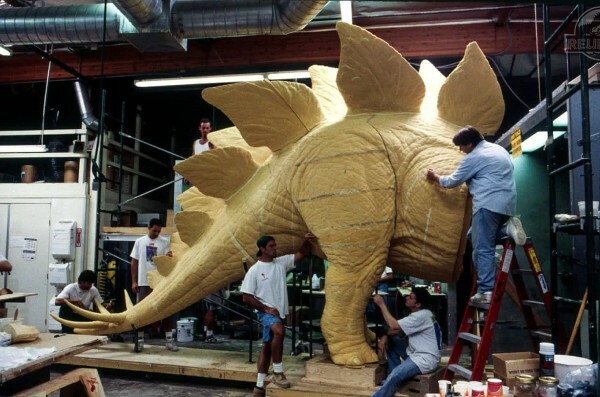 During the filming of the baby Stegosaurus, the puppet was performing perfectly and then began to drool hydraulic fluid. 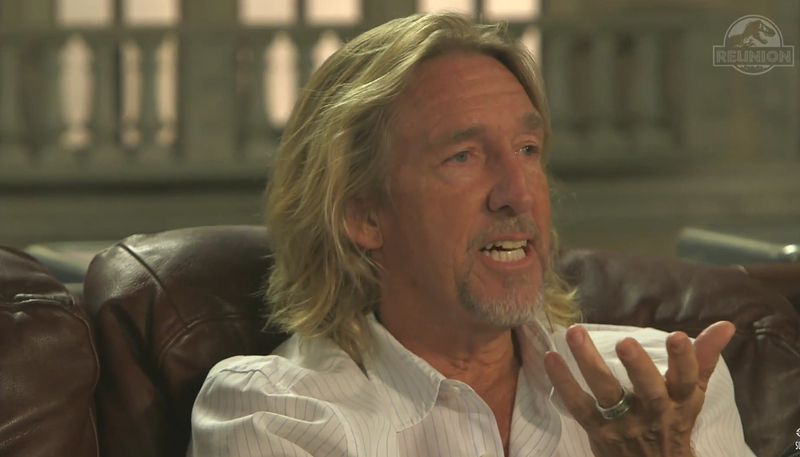 Steven Spielberg thought the drooling was an effect and asked the puppeteers to continue with it. Shortly after, the fluid started spewing in mass quantity and saturated (almost completely ruining) the latex mouth of the baby Steg. 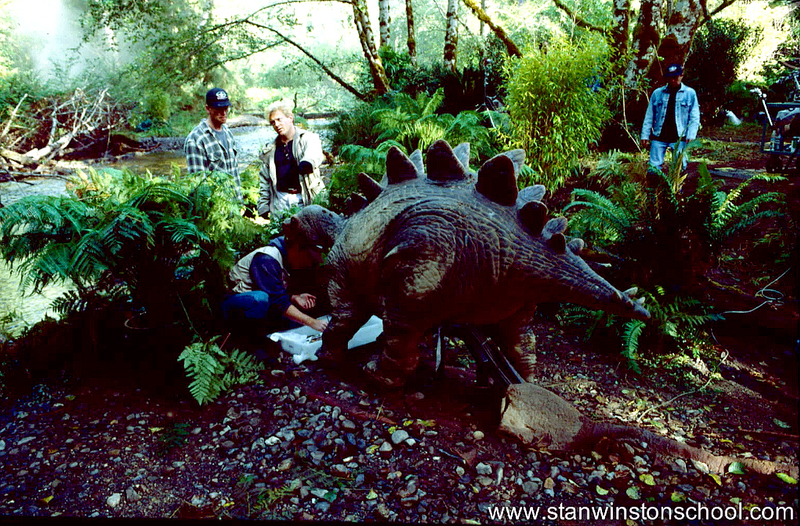 The film shoot at the state park in Eureka, CA presented new challenges for the live action dinosaur team. They could not damage any of the location or wildlife and often worked in difficult terrain running cables and equipment for the dinosaurs while under the watchful eye of park rangers. 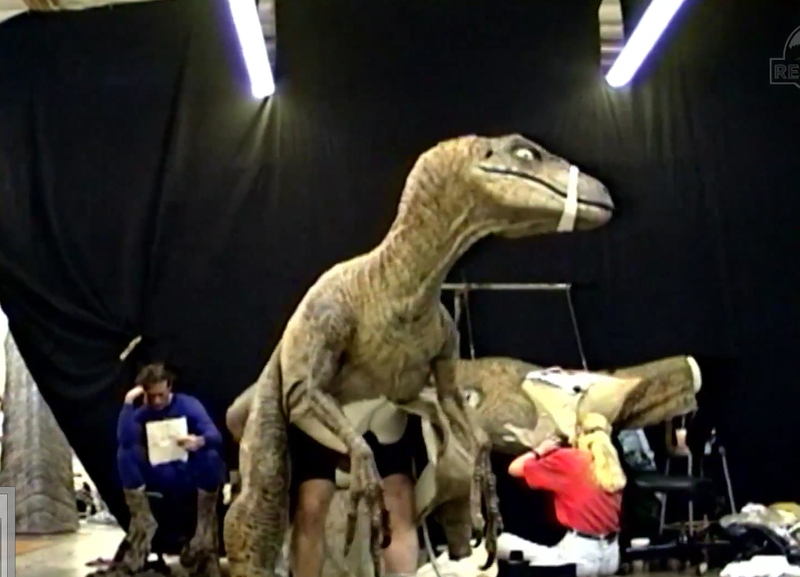 Shooting the scene in which a stunt person is pulled from the Mercedes by the T-Rex was the most stress-filled day for puppeteer John Rosengrant. He had to carefully plan and execute his manipulation of the Rex so he would not crush or throw the stuntman on set. 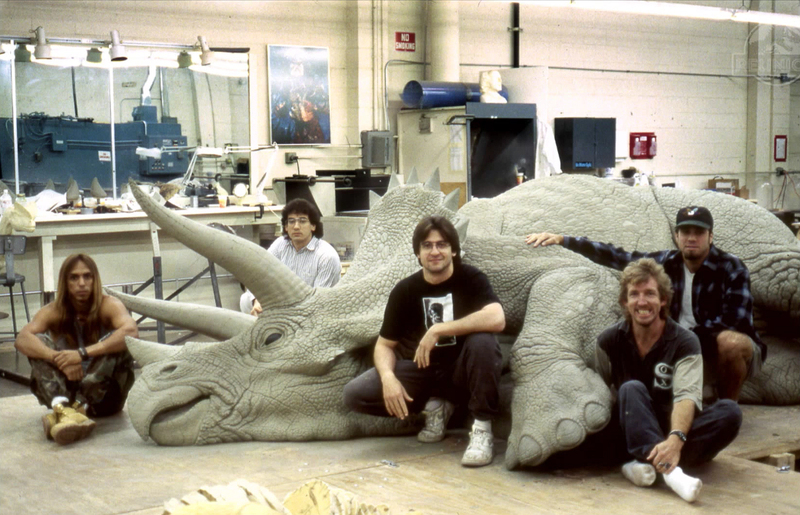 To create the effect of the Triceratops crashing through a camp tent, the Triceratops animatronic head was simply mounted to an automobile and driven into the scene. During filming, Tea Leoni was genuinely scared of working with the dinosaurs and took the crew warnings about them being ‘dangerous machines’ very seriously. When filming had completed, Joe Johnston told the puppeteers to actually pit the Spinosaurus robot vs. the T-Rex robot to see which dinosaur would win. This was done much to the ire of several of the dinosaur crew members who had spent the entire shoot trying to keep the dinosaurs in pristine condition. 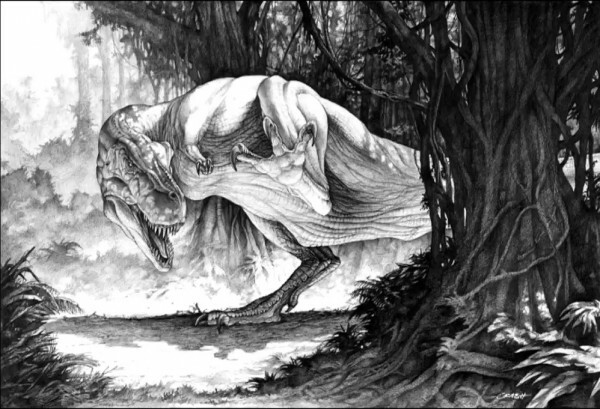 Footage is said to exist of the fight that show the Spinosauris ripping the head off of the T-Rex. During the build time of the dinosaurs for JP3, Michael Jackson stopped by the Stan Winston Studio with his family as he was fascinated with creature design. 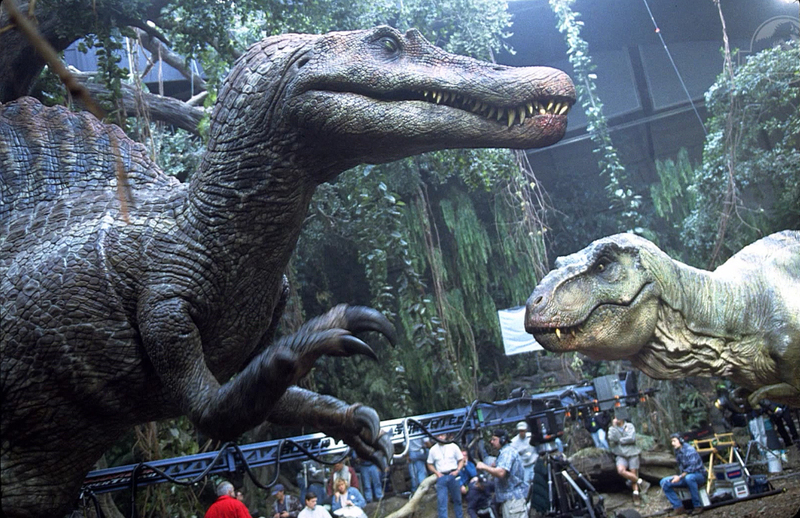 Director Colin Trevorrow had to fight to have the production allow Legacy Effects create at least one animatronic dinosaur for the film. 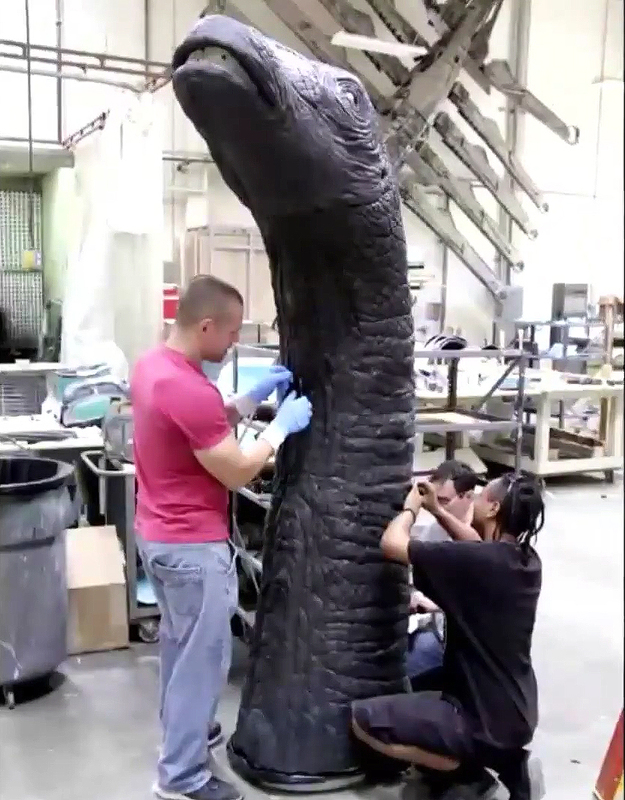 He got his wish and a cable-controlled neck and head were created for the Apatosaurus death scene. 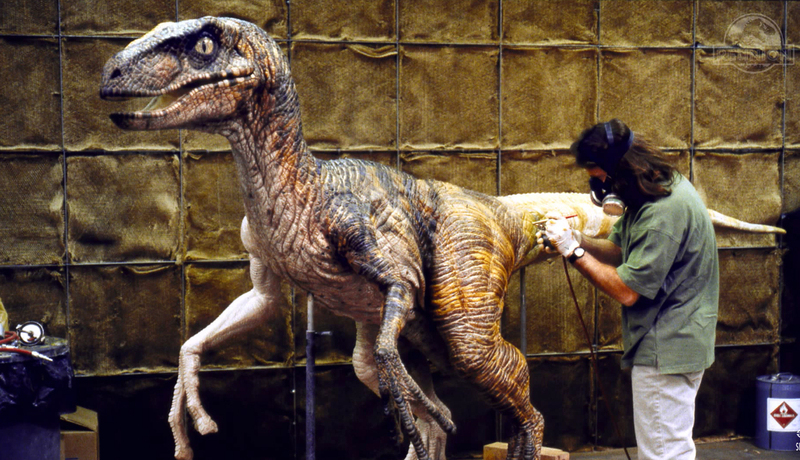 Legacy Effects contributed a lot to the design of the dinosaurs for the film by building life-size maquettes of Raptors for use during filming along with sketches and models for dinosaurs that would be completely rendered in CGI. John Rosengrant was delighted to see the Tyrannosaurus Rex from the first Jurassic Park return for a cameo at the end of the film. 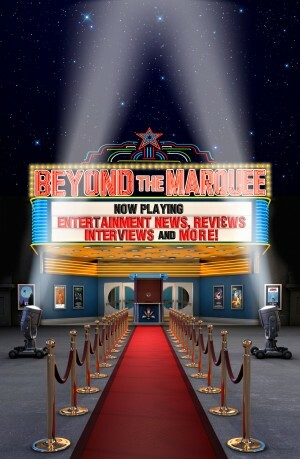 When he’s not wrangling dinosaurs, Kevin Stern serves as a co-producer and contributing writer for Beyond the Marquee. Take pleasure in the rest of a new year.